The Port Townsend Marine Science Center will sponsor what should be a very popular pair of presentations on earthquake and tsunami hazards of the Port Townsend region. Our invited speakers are Brian Atwater, a geologist with the U.S. Geological Survey in Seattle and Ron Tognazzini, a retired civil engineer from Sequim. Interestingly, this early talk from out Geology Group Lecture Series drew a record crowd—225 persons—largely as a result of excellent and free publicity. On March 11, 2011, two weeks prior to the lecture, the Tōhoku Earthquake struck Japan and a very large tsunami took out the Fukushima Nuclear generating plant. Over 17,00 fatalities resulted from this disastrous event. Dr. Atwater’s specialty is paleoseismology—the study of prehistoric earthquakes. Brian will begin with detective stories of Pacific Northwest earthquakes and tsunamis. Then he’ll turn to eyewitness accounts of tsunamis in Indonesia, and of the public-safety lessons they provide. 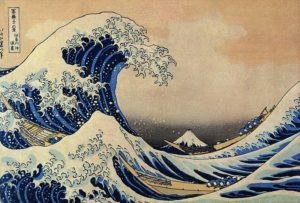 If you have a business or residence near the coast, this presentation will show you what might happen during the run-up from a large tsunami. Ron is a civil engineer by practice but has considerable experience in natural disaster preparedness and emergency response. Ron will present recent award-winning research by Marley Iredale, a Sequim high-school student that he mentored in 2009. Marley’s research records 2,500 years of recurring tsunamis at Discovery Bay, near the Snug Harbor Restaurant. This record applies equally well to the Port Townsend region, where no tsunami studies have been conducted so far. 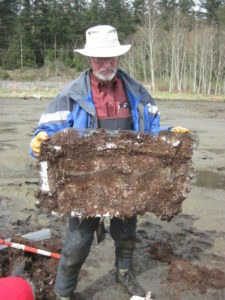 In the adjacent photo, Ron is holding a latex peel of marsh and tsunami sand deposits.